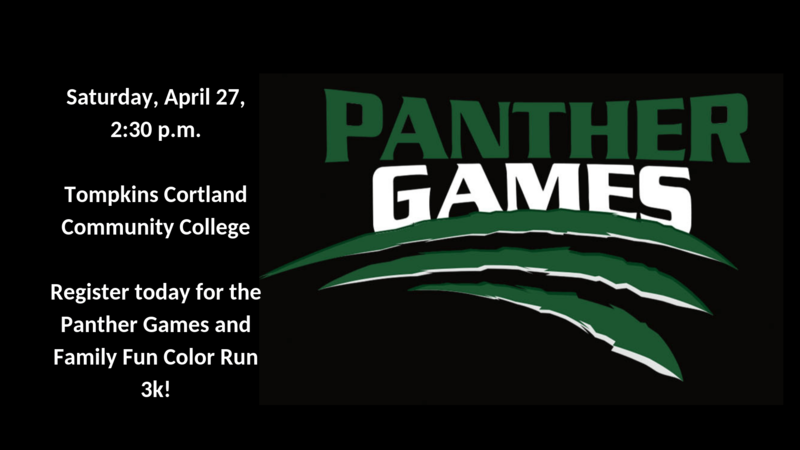 DRYDEN, N.Y. — Tompkins Cortland Community College is teaming up with the YMCA of Ithaca and Tompkins County and the Cortland County YMCA to host Panther Games, a FUNdraiser for childcare at all three organizations. The April 27 event will kick off at 3 p.m. with a Family Fun Color Run, a 3K run/walk around campus that culminates with a color splash. In addition to the Color Run, the College’s athletics facility will host a variety of inflatables and other fun competitions where participants can earn tickets for a chance to win one of several family-themed prize baskets. Registration for the Color Run includes a t-shirt and costs $10 for adults and $5 for children under 10 years old. Participants in the Color Run must register online prior to the event — there will be no day of the event registration for the Color Run. The event is sponsored in part by Visions Federal Credit Union, Cayuga Xpress, and Bobby K Entertainment. For more information and to register to participate in the event please visit www.tompkinscortland.edu/panthergames.